Ten year old girls will appreciate getting this pretty, floral, feminine card from a sibling, right? At least a girly girl would (and those who are girly at heart). I definitely went big on all of the above on this birthday card made with Chickaniddy 365 and some odds and ends from my stash. Just beautiful, Lisa, love the colors! 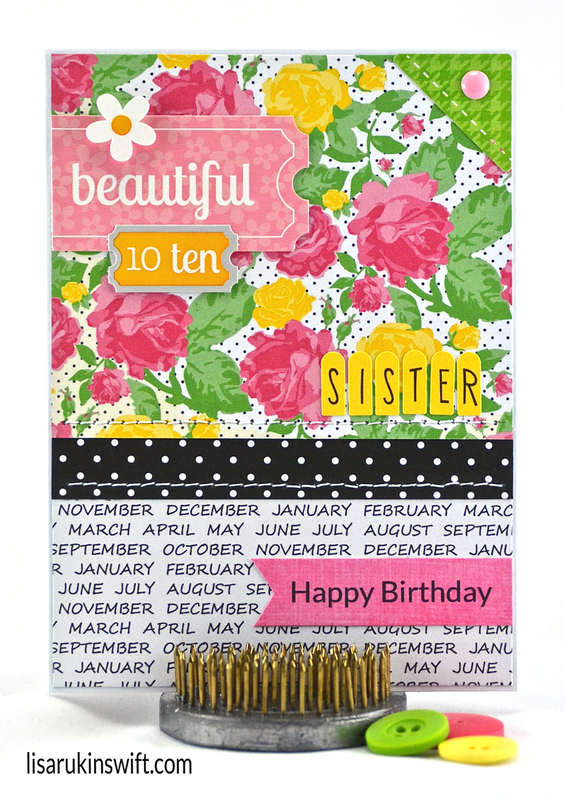 It will be such a sweet card for a lovely young girl to receive! This is gorgeous! LOVING the colors and the stitching!!!!!!!! LOVE the papers. pretty pretty!!! 10 year olds?!? I know plenty of adult women who would love anything pretty and floral..um..me..hello..this is so pretty! What a sweet card. I love the way you used the text paper to offset the floral. Gorgeous! This is so awesome and I just love the colors and the utter, complete sweetness this has!! Love it!! This is BEAUTIFUL!!! I love the way you used that floral paper with all the accents (yellow and black)! !